Date read: 5/29/18. Recommendation 7/10. Rubin details four main personality tendencies–upholder, questioner, obliger, rebel–that we all gravitate towards based on how we handle internal and external expectations. It's an interesting look into human nature and quite valuable when considering how we should motivate, persuade, or navigate conflict with ourselves and others. There's no one-size-fits-all. 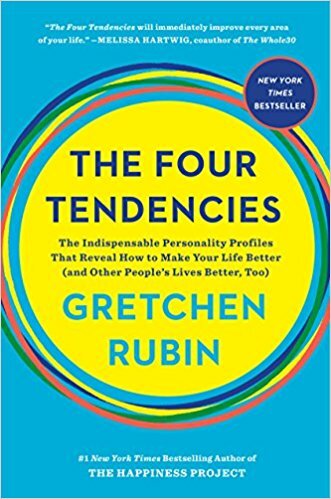 She details each of the four tendencies in depth, while conceding that there are an enormous range of personalities, even among people with the same tendency. This dramatically influences how each of the tendencies are expressed. The goal of the book is to help us better understand ourselves and those around us by building greater self-awareness and acknowledging our differences. That way we can leverage our strengths, navigate our weaknesses, and build lives that work better for us. My great interest is human nature, and I constantly search for patterns to identify what we do and why we do it. When we consider the four tendencies, we're better able to understand ourselves. This self-knowledge is crucial because we can build a happy life only on the foundation of our own nature, our own interests, and our own values. There's an enormous range of personalities, even among people who share the same tendency...These qualities dramatically influence how they express their tendencies. There's no best or worst tendency. The happiest, healthiest, most productive people aren't those from a particular tendency, but rather they're the people who have figured out how to harness the strengths of their Tendency, counteract the weaknesses, and build the lives that work for them. Knowing other people's tendencies also makes it much easier to persuade them, to encourage them, and to avoid conflict. Weaknesses include delegating (doubt others ability to follow through), holding others accountable (since they don't need outer accountability, not sympathetic towards those that do). Upholders value self-command, so they tend to pay a lot of attention to getting enough sleep, exercising, having fun, keeping gas in the car, and so on. Upholders also least likely to struggle with addiction. Although upholders can indeed reject outer expectations in order to meet inner expectations, they don't always have a clear sense of what they expect from themselves. For an inner expectation to be met, it must be clearly articulated. Therefore, upholders must take care to define for themselves what they want and what they value–that clarity is essential. For me, once I'd clearly heard the voice of my own inner expectation, doing the work wasn't hard. But it took me a long time to hear that voice. Upholders want people to do things for their own reasons–which is a big demand. Least distinctive tendency, other three tendencies recognize how they're different from other people. Questioners view their questioning not as evidence of a pattern but as merely the logical, universal response to life. Upholders and questioners are self-centered and self-ish, in the sense that the aims of the "self," which are inner expectations, are at the core of what they do. Obligers must pick the right kind of accountability for them...vary dramatically in what makes them feel accountable. Obliger rebellion - obliger keeps meeting expectations that seem unreasonable until the "snap" which is almost always abrupt. -Wake up and think "what do I feel like doing right now?" Rebel/questioners: "I do whatever I choose." Rebel/obligers: "I refuse to do what anyone tells me to do." For information-consequences-choice to work, it's crucial that rebels do indeed suffer unpleasant consequences. Information, consequences, choice. Without lectures or micro-management or rescue. Rebels become dependent. Their freedom from the mundane responsibilities of life is often possible because someone else handles the duties of daily existence for them. Rebels respond much better when an action is framed in terms of choice, freedom, and self-expression instead of constraint and duty. It's all too easy to assume that what persuades us will persuade others–which isn't true. One of my secrets of Adulthood is that we're more like other people than we suppose and less like other people than we suppose. Upholders want to know what should be done. Questioners want justifications. Obligers need accountability. Rebels want freedom to do something their own way. Upholders value self-command and performance. Questioners value justification and purpose. Obligers value teamwork and duty. Rebels value freedom and self-identity. Date read: 3/27/18. Recommendation: 8/10. Quiet is a bible for introverts. Cain struck a chord with a massive, often overlooked audience, with an insightful look into the place of introversion in our culture that has come to hold extroversion as the highest ideal. But it's an important book for introverts and extroverts alike. For introverts, it offers a resource and the reassurance to be authentic, put yourself in the right lighting, and use your natural strengths. Cain also digs into concepts like restorative niches, soft power, self-monitoring, and deliberate practice–all familiar concepts to introverts. She also gets a bit more granular and discusses the difference between temperament and personality, nature vs. nurture, and the evolutionary benefits to each personality type. As Quiet suggests, the goal is to identify your own preferences along the spectrum introversion/extroversion so you can spend more time in your sweet spot and get the most out of your life. Some of our greatest ideas, art, and inventions–from the theory of evolution to van Gogh's sunflowers to the personal computer–came from quiet and cerebral people who knew how to tune in to their inner worlds and the treasures to be found there. I have seen firsthand how difficult it is for introverts to take stock of their own talents, and how powerful it is when finally they do. Introverts are drawn to the inner world of thought and feeling, extroverts to the external life of people and activities. Introverts focus on the meaning they make of the events swirling around them; extroverts plunge into the events themselves. Introverts recharge their batteries by being alone; extroverts need to recharge when they don't socialize enough. Introverts often work more slowly and deliberately. They like to focus on one task at a time and can have mighty powers of concentration...They listen more than they talk, think before they speak, and often feel as if they express themselves better in writing than in conversation...Many have a horror of small talk, but enjoy deep discussions. Shyness is the fear of social disapproval or humiliation, while introversion is a preference for environments that are not overstimulating. How did we go from Character to Personality without realizing that we had sacrificed something meaningful along the way? In the United States, Don [Chinese American] feels conversation is about how effective you are at turning your experiences into stories, whereas a Chinese person might be concerned with taking up too much of the other person's time with inconsequential information. We perceive talkers as smarter than quiet types–even though grade-point averages and SAT and intelligence scores reveal this perception to be inaccurate. We don't need giant personalities to transform companies. We need leaders who build not their own egos but the institutions they run. Introverts are uniquely good at leading initiative-takers. Because of their lack of inclination to listen to others and lack of interest in dominating social situations, introverts are more likely to hear and implement suggestions....Introverted leaders create a virtuous circle of proactivity. Team members perceive introverted leaders as more open and receptive to their ideas, which motivated them to work harder. Introverts prefer to work independently, and solitude can be a catalyst to innovation. Solitude is key to creativity for introverts (and the most creative people are typically introverts). While extroverts tend to attain leadership in public domains, introverts tend to attain leadership in theoretical and aesthetic fields. It's only when you're alone (as proven by top students and elite athletes) that you can engage in Deliberate Practice, the key to exceptional achievement. When you practice deliberately, you identify the tasks or knowledge that are just out of your reach, strive to upgrade your performance, monitor your progress, and revise accordingly. Deliberate Practice is best conducted alone because it requires intense concentration, deep motivation (often self-generated), and involves working on the task that's most challenging to you personally. I'm prone to wild flights of self-doubt, but I also have a deep well of courage in my own convictions. I feel horribly uncomfortable on my first day in a foreign city, but I love to travel. The heritability statistics derived from twin studies show that introversion-extroversion is only 40 to 50 percent heritable. This means that, in a group of people, on average half of the variability in introversion-extroversion is caused by genetic factors. The parents of high-reactive children are exceedingly lucky, Jay Belsky told me. "The time and effort they invest will actually make a difference. Instead of seeing these kids as vulnerable to adversity, parents should see them as mealleable–for worse, but also for better." Ideal parent: "Someone who can read your cues and respect your individuality; is warm and firm in placing demands on you without being harsh or hostile; promotes curiosity, academic achievement, delayed gratification, and self-control; and is not harsh, neglectful, or inconsistent." Rubber band theory of personality: We are like rubber bands at rest. We are elastic and can stretch ourselves, but only so much. Over-arousal doesn't produce anxiety so much as the sense that you can't think straight–that you've had enough and would like to go home now. Under-arousal is something like cabin fever. Not enough is happening: you feel itchy, restless, and sluggish, like you need to get out of the house already. Once you understand introversion and extroversion as preferences for certain levels of stimulation, you can begin consciously trying to situate yourself in environments favorable to your own personality–neither overstimulating nor understimulating, neither boring nor anxiety making. You can organize your life in terms of what personality psychologists call "optimal levels of arousal" and what I call "sweet spots," and by doing so feel more energetic and alive than before. Scientists have found that nomads who inherited the form of a particular gene linked to extroversion (specifically, to novelty-seeking) are better nourished than those without this version of the gene. But in settled populations, people with this same gene form have poorer nutrition. Introverts also seem to be better than extroverts at delaying gratification, a crucial life skill associated with everything from higher SAT scores and income to lower body mass index. Introverts are "geared to inspect" and extroverts "geared to respond." If genius is one percent inspiration and ninety-nine percent perspiration, then as a culture we tend to lionize the one percent. We love its flash and dazzle. But great power lies in the other ninety-nine percent. We tend to overvalue buzz and discount the risks of reward-sensitivity: we need to find balance between action and reflection. Though Eastern relationship-honoring is admirable and beautiful, so is Western respect for individual freedom, self-expression, and personal identity. The point is not that one is superior to the other, but that a profound difference in cultural values has a powerful impact on the personality styles favored by each culture. "Soft power" – Leadership by water rather than by fire. Free Trait Theory: fixed traits and free traits coexist. We are born and culturally endowed with certain personality traits–introversion, for example–but we can and do act out of character in the service of "core personal projects." Self-monitoring: Introverts who were especially good at acting like extroverts tended to score high for a trait that psychologists call "self-monitoring." Self-monitors are highly skilled at modifying their behavior to the social demands of a situation. The highest self-monitors not only tend to be good at producing the desired effect and emotion in a given social situation–they also experience less stress while doing so. 1) Think back to what you loved to do when you were a child. The specific answer you gave may have been off the mark, but the underlying impulse was not. 2) Pay attention to the work you gravitate to. 3) Pay attention to what you envy. Jealousy is an ugly emotion, but it tells the truth. "Restorative niche" – The place you go when you want to return to your true self. Understanding introversion changes one's parenting style. The key is to expose your child gradually to new situations and people–taking care to respect his limits, even when they seem extreme. This produces more-confident kids than either overprotection or pushing too hard. The school environment can be highly unnatural, especially from the perspective of an introverted child who loves to work intensely on projects he cares about, and hang out with one or two friends at a time...Worst of all, there's little time to think or create. The structure of the day is almost guaranteed to sap his energy rather than stimulate it. People flourish when, in the words of psychologist Brian Little, they're "engaged in occupations, roles or settings that are concordant with their personalities." The way we characterize our past setbacks profoundly influences how satisfied we are with our current lives. Those who live the most fully realized lives–giving back to their families, societies, and ultimately themselves–tend to find meaning in their obstacle. Where we stumble is where our treasure lies. Love is essential; gregariousness is optional. Cherish your nearest and dearest. Work with colleagues you like and respect. The secret to life is to put yourself in the right lighting...Use your natural powers–of persistence, concentration, insight, and sensitivity–to do work you love and work that matters. Solve problems, make art, think deeply. Spend your free time the way you like, not the way you think you're supposed to...Read. Cook. Run. Write a story. Make a deal with yourself that you'll attend a set number of social events in exchange for not feeling guilty when you beg off. Don't mistake assertiveness or eloquence for good ideas. If you have a proactive work force, remember that they may perform better under an introverted leader than under an extroverted or charismatic one. Introverts are offered keys to private gardens full of riches. To possess such a key it to tumble like Alice down her rabbit hole. She didn't choose to go to Wonderland–but she made of it an adventure that was fresh and fantastic and very much her own.